Used by health clinics and medical professionals. We say it helps up to 95% of cases, but we have 100% success so far. On courses, Allan Sweeney guarantees 10 times the money back if it doesn't help! inflammation, migraine, pain, phobia, eczema, tension, fear, bereavement, asthma, reduce blood pressure, increase skin resistance, quiet the autonomic nervous system, decrease anxiety, reduce hypertension, decrease addictions, help insomnia and negative emotions such as anger, hate, revenge or sadness. Effects of this CD is better all-round health, greater inner peace and more happiness in the soul. 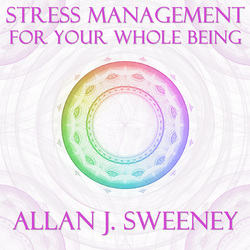 For over 30 years Allan J. Sweeney tried to find the easiest and quickest ways to heal. These Mental & Emotional Healing methods are gentle, yet highly successful. PinkSwift Emotional Therapy - has a high success rate - up to 75% are cured! The technique releases emotional issues such as sadness, anger, hate and bereavement. 4S Therapy - is a similarly successful method to relieve mental problems such as fear, negativity, phobias. Up to 75% cure rate! Just listen and let go! 1. During your daily self-help treatment, play the track relevant to your main self-healing requirements. 2. Continuous play a track specific to your patient's needs in a therapy session. 3. 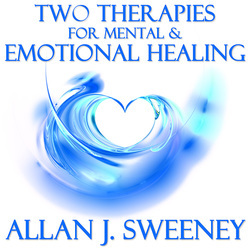 Listen to the complete CD for thorough healing of body, emotions. mind, psychic, spirit, etheric arid soul. 1) Allan J Sweeney met the acclaimed International flutist Paul Cheneour, during one of Allan's support days for therapists in Her Majesty's Prison Coldingley. Paul could hear energies of healing symbols, and play them on his flutes! The music of the symbols entranced all present by its powerful healing sounds. 2) In ancient times, all Egyptian doctors were musicians; witch-doctors sung to release disease: and the Yellow Emperor used 32 different healing vibrations. Symbols are mathematical energies and Pythagoras said that mathematics is based on harmonic principles. 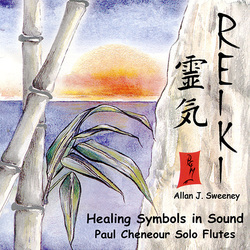 This album is music of the healing dance, a lost healing vibration brought to life by flutes. A WORLD FIRST. At last we are returning to the healing use of music. CD Reviews. "The flute sound finds its way into every crack and crevice. What you play is pure Gospel. Keep reaching out and touching with your music." New Zealand Music Magazine reviewer. "Thank you for sending the Reiki CD. I have only been able to play it once - but that once has shown that it is something very special." Angela Collis. BRACE was researched via the Ins of Education at the University of London. There's a remarkable success rate – 90.9% of children are helped or cured in 3 weeks. Assessments of ADHD children one year after therapy showed 96.9% of children helped or cured.